This is my latest escapade in Project Pastry Queen (go here for background info). Ladyfingers seem intimidating but are actually quite easy to make. The secret is to beat the egg yolks until they are thick and pale yellow, beat the egg whites until they are quite stiff, and gently fold in the flour without deflating the whites too much. 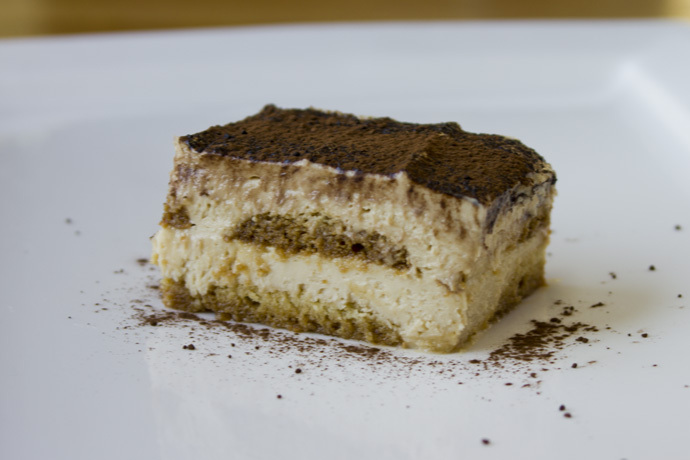 The filling is quite rich so the tiramisu can be served in small portions. It’s delicious served with cup of hot coffee, and will keep refrigerated for at least a week. Beat egg yolks and sugar until thick and light in color. Fold beaten egg whites and yolks together. Sift flour over the eggs and fold in gently. Pipe the ladyfingers onto prepared baking sheets. Preheat the oven to 375°F. Line two baking sheets with parchment paper. Use a fine strainer to dust the paper with a light coating of powdered sugar. 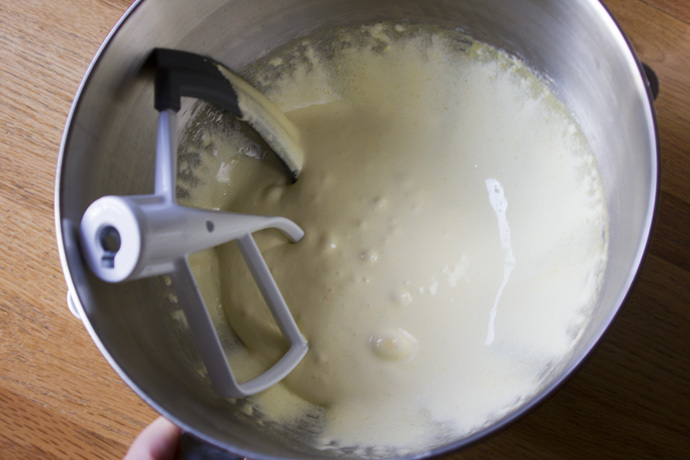 Using a mixer fitted with a paddle attachment, beat the egg yolks, 3/4 cup granulated sugar, and vanilla in a large bowl on high speed about 5 minutes, until the yolks become thick and pale yellow. 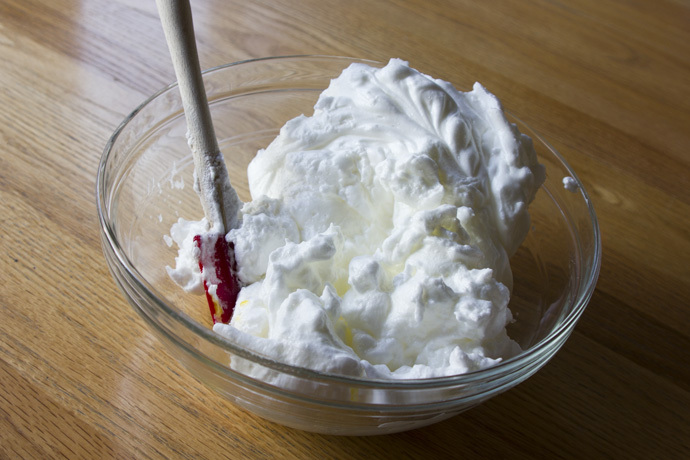 In a separate clean, large bowl, use a mixer fitted with a whisk attachment to beat the egg whites on high speed until stiff peaks form. Add the 1/4 granulated sugar very gradually and beat until sugar is completely dissolved. 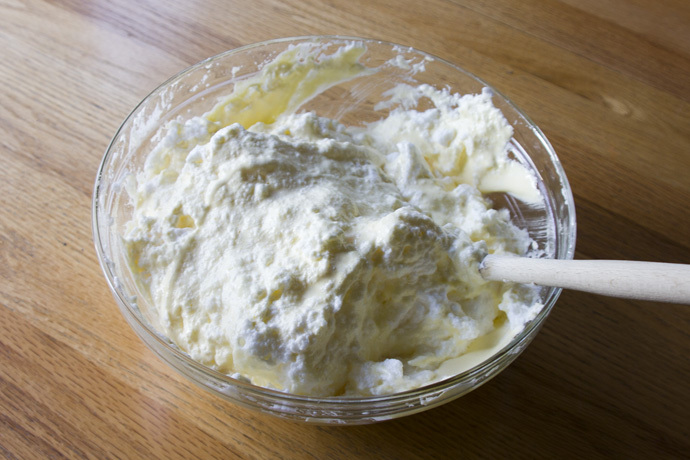 (OR, if you only have one mixer bowl, beat the egg whites first, set aside, then beat the egg yolks.) Fold the egg white mixture gently into the egg yolk mixture. 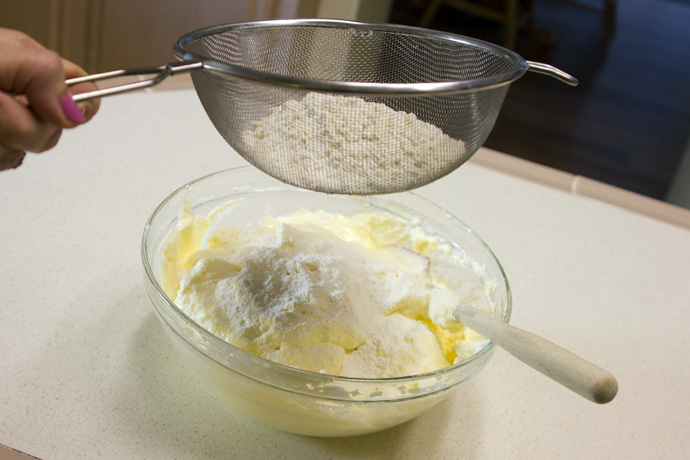 Use a fine mesh strainer to sift the flour over the batter. Sift the flour over the top of the eggs and gently fold in just until incorporated. Spoon the batter into a pastry bag fitted with a large round tip (or use an open coupler without a tip). 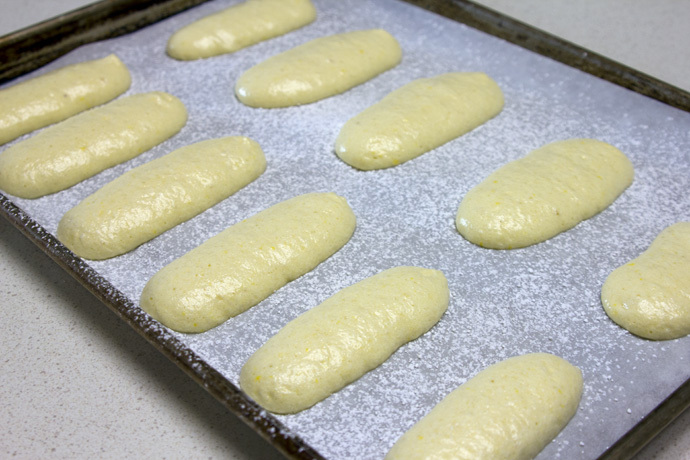 Pipe the batter onto the prepared baking sheets, making each ladyfinger about 3 inches long and 1 inch wide. Bake about 8-10 minutes, until lightly browned. Sift the 1/2 cup powdered sugar over the ladyfingers just as they come out of oven. Cool on the baking sheets 5 minutes before using a spatula to transfer to cooling racks. Combine the water, sugar and espresso powder (or Via powder) in a small saucepan. Bring to a simmer and stir to dissolve sugar. Remove from heat, add vanilla, and set aside to cool. Combine the boiling water and espresso powder in a small bowl. Mix the espresso liquid into the filling. Coat a 9×13-inch baking pan with cooking spray. Dip both sides of 1 ladyfinger in the cooled soaking syrup and place in the bottom of the pan. Repeat with more ladyfingers and syrup to line the whole pan. Spoon half the filling mixture evenly over the ladyfingers and smooth gently with a spatula. Cover with a second layer of dipped ladyfingers. Spoon the remaining cream cheese mixture over them and smooth the top. Use a fine strainer to dust the top with a light coating of dark cocoa powder. 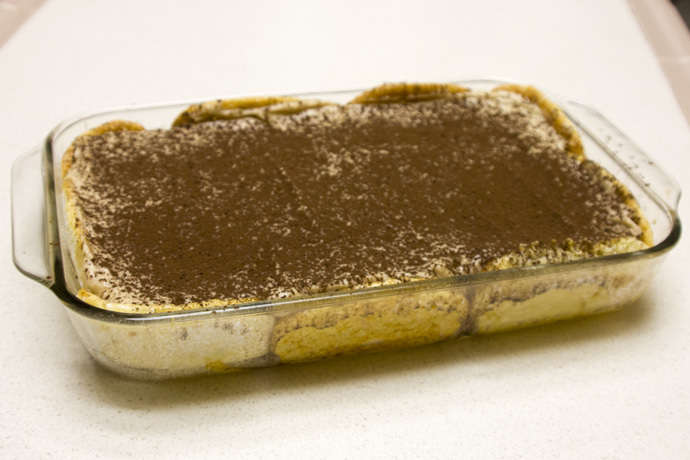 Cover the tiramisu and refrigerate for at least 2 hours or overnight. Cut into squares and use a metal spatula to remove them for serving. Your ladyfingers are perfect! I hear you on the richness, a little definitely goes a long way.